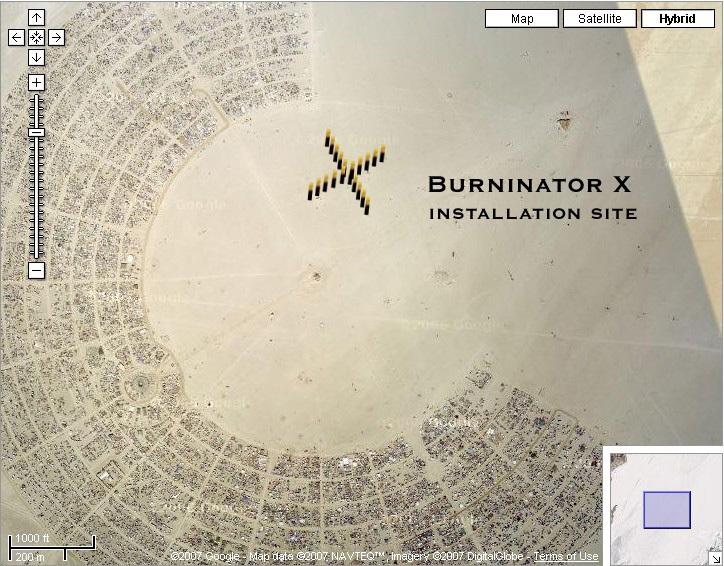 Last year saw the successful completion of one of the most exciting largest-scale fire installations in Black Rock City, the Burninator II, thanks to the Burninator Crew in conjunction with the generous grant from the Burning Man organization. The Burninator II, built for last year's event, took the idea of fire art and made it really large - playa-scale large - for the first time. We were able to see what fire could look and feel like both from nearby - the flames near spectators and art cars had a great power, and far away - they were visible anywhere you were over the chaos in Black Rock City. It would be great to make the Burninator even larger (possibly stretching from the Temple to the Man?). Safety considerations might make that difficult or impossible, with fuel sources much too far from the operators and large electrical and signal losses. SO, it's now time to take this idea into two dimensions, from huge to really overwhelming...a half-million square feet overwhelming! The Burninator X for this year will be built in the shape of an X, with the two axes of the arms perpendicular to each other, aligned with the axes of the city. The move into two dimensions is something the Burninator installations need to do. The flame will be visible along both axes; from everywhere in the city the fire will be visible, but it will be hard to tell how close you are to the installation. Standing near, you will not be able to see everything without turning around. The patterns, which last year were very linear, will now become two-dimensional; fire can rotate along the spokes of the X; it can sweep across, it can converge in towards the center or fly outwards, it can spiral in or out from the center. The noise and visceral effects of these new patterns will also take the feel of the Burninator to a new level. Standing anywhere within the half-million square-foot footprint will be to experience being surrounded by the flames and the patterns. I like to use technology to create art, and control large-scale fire in safe and creative ways. I feel that the beauty of fire, and art created with fire, is enhanced by the power inherent in the flames and the respect and sense of fear that come along with it. That power is one of the attractions of fire art and one of the elements of fire art that is being further explored here. It compels you to look straight at the flames; they grab and focus your full attention, and force you to see the art with no distractions. 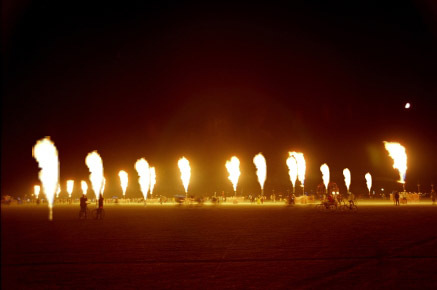 I also want to use the attraction that spectators feel to morph into participation (and to mitigate that fear), by giving them the rare chance to approach the artwork and control the power of large-scale flame art themselves. That attraction can also serve to open the door to education about the environmental considerations of fire art and carbon-based fuels. The interactivity of this piece will take on two forms: educating about carbon emissions, and once again allowing spectators to safely operate the installation. 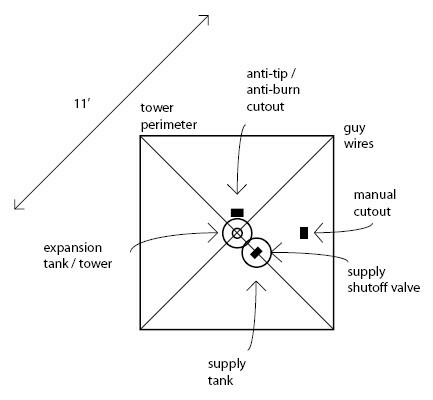 Once again user interfaces will be in place to allow participants to approach the control station and control the power of the flames themselves. As before, the idea is to allow participants to approach fire art in a way they may not have been allowed to before. Based on the feedback from participants last year, the user interfaces will also be advanced this year. The two-dimensional nature of the installation requires new thought as to how the participants will interact with the control center. The main interfaces will be a computer GUI, cards which when scanned will create patterns of fire, and possibly arcade-type games. This has been one of the greatest appeals of the Burninators, allowing the participants to feel the control of the flames themselves. A significant portion of the Burninator II can be used for a head start on this year's Burninator X. Many of the towers, valves, and wiring harness are already constructed and are re-useable, except for the costs and time for repair of some equipment and one tower. The electronics were constructed in such a way as to be expandable, and that will be leveraged. Much more effort will be directed this year towards making the patterns more complex than the patterns of last year. The 2-D nature of this installation will provide some of this, but extra effort will be put in to ensure that the two dimensions are used as best as possible. The sequencing and control software was rewritten last year to be more generic to the control hardware and the installation size. This work will continue, with the goal to be a package that may be able to be reused for other fire art projects. Plans are to make this code available to others for their projects. A great deal more of the construction will need to be done in the Bay Area this year, and more crew will be necessary if this is to be done. Commitments have already been made by some of the necessary people for the electronics, the safety, the construction, and operation. 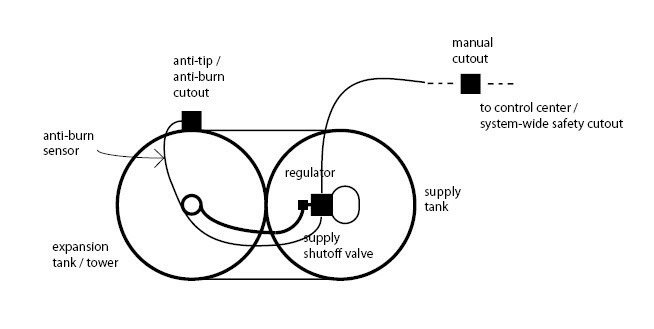 The safety systems for last year's Burninator II were trying to advance the idea of safety for large scale fire, with new ideas on both operational safety and advances in the mechanical and electrical control of propane that is not directly nearby - including tip sensors and automatic burn sensors with shutoff mechanisms. This year more new safety mechanisms will be tested, including a radio-controlled remote shutoff system. The existing safety plan of the Burninator II will be enhanced for the new safety systems and the larger installation size. The full safety plan will be submitted and discussed before the event, with the safety mechanisms, diagrams, and procedures. The safety and fire contacts within the organization can testify as to the Burninator's crew's mind to safety, and safety record. As noted above, some of the components (except those damaged by the desert conditions last year) are reusable. The estimate here takes this into account and does not include the towers previously built. Once again, the most significant portions of the cost is the propane, and in making the components reliable, industrial strength, and rated for safety. These estimates reflect recycled and already available equipment and material as possible. Heavy Equipment: again, the only need will be for 2 hours of a trencher. Due to the cleanup plan and carbon offsets purchased for the Burninator II, it was selected as one of last year's 'Leave No Trace' example projects. Again, there is no denying the environmental impact of the carbon dioxide created by burning tons of propane for fire art. The damage from the CO2 created will, as last year, be mitigated by purchasing carbon offsets, making the installation carbon-neutral. I have been a part of the Burning Man community for 13 years; I've been a part of very large projects for more than half of those, with my own art, the Temples, and the Burninator projects. 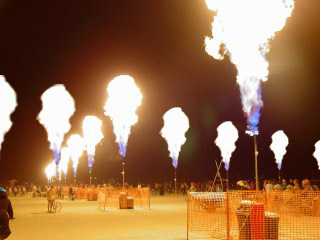 Last year's Burninator II was very well received - it became a destination on the playa for people, art cars, and busses. Many people said it was their favorite fire art, some said of any kind of art, and quite a number (bless their little spectator hearts) even said their favorite ever. The Burninator team intends to do it again!